These six images from NASA's Mars rover Curiosity show the two moons of Mars moments before (left three) and after (right three) the larger moon, Phobos, occulted Deimos on Aug. 1, 2013. On each side, the top image is earlier in time than the ones beneath it. A spectacular new video from NASA's Mars rover Curiosity shows the Red Planet's two tiny moons eclipsing each other in an otherworldly skywatching first. 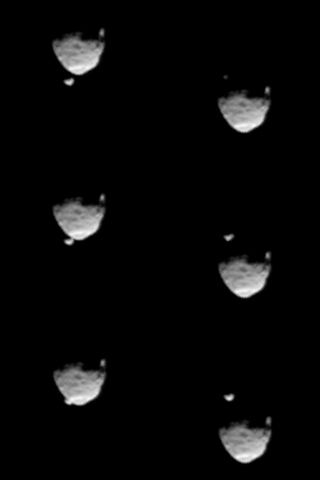 Curiosity snapped 41 images of the Mars moons in the night sky on Aug. 1, with rover scientists then stitching them together to make the final 30-second video. It is the first time a view of the two Martian satellites — called Phobos and Deimos — eclipsing each other has been captured from the vantage point of the planet's surface, NASA officials said. This view of the two moons of Mars comes from a set of images taken by NASA's Mars rover Curiosity as the larger moon, Phobos, passed in front of the smaller one, Deimos, from Curiosity's perspective, on Aug. 1, 2013. "The ultimate goal is to improve orbit knowledge enough that we can improve the measurement of the tides Phobos raises on the Martian solid surface, giving knowledge of the Martian interior," Mark Lemmon of Texas A&M University said in a statement. "We may also get data good enough to detect density variations within Phobos and to determine if Deimos' orbit is systematically changing," added Lemmon, who is a co-investigator for Curiosity's Mastcam instrument, which took the pictures using its telephoto lens. Phobos' orbit is taking it closer to the surface of Mars very slowly, researchers said, while Deimos may gradually be getting farther and farther away from the planet. Phobos is just 14 miles (22 kilometers) wide on average, while Deimos is even smaller. But Curiosity was able to spot both of them because they orbit quite close to the Red Planet's surface — 3,700 miles (6,000 km) in Phobos' case and 12,470 miles (20,070 km) for Deimos. Earth's moon is gigantic compared to Phobos and Deimos, with a diameter of about 2,160 miles (3,475 km). But our planet's natural satellite orbits much farther away — its average distance is 239,000 miles (384,600 km) — so Phobos appears half as big in the sky to Curiosity as Earth's moon does to human skywatchers, NASA officials said. The 1-ton Curiosity rover landed on Mars on Aug. 5, 2012 to determine if the Red Planet could ever have supported microbial life. The six-wheeled robot has already achieved that mission goal, finding that a site called Yellowknife Bay was indeed habitable billions of years ago. Curiosity is now embarked upon a long drive to the foothills of the huge Mount Sharp, whose many layers hold a record of the Red Planet's changing environmental conditions over time. Mission scientists want Curiosity to read that history like a book as it climbs up through the mountain's lower reaches.